SPSCAP®EDLC ultracapacitors using ACP activated carbon coating/dry-method electrode and organic electrolyte system, characterized by high capacity, low resistance, low leakage, and high reliability. 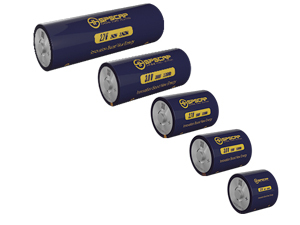 The super capacitors combine the features of the normal capacitor in rapid charging and discharging ability and the energy storage ability of battery, so SPSCAP® super caps bridge the gap between electrolytic capacitors and rechargeable batteries. According to different capacity and appearance, three series supercaps such as SCE, SCP are available. A supercapacitor (or ultra capacitor) is a high-capacity capacitor with F grade capacitance. An ultracapacitor tends to differ from an ordinary capacitor due to its very high capacitance.It combines the features of the ordinarycapacitor in rapid charging and discharging ability and the energy storage ability of battery, so supercapacitor bridges the gap between electrolytic capacitors and rechargeable batteries.Ultracapacitor is called a revolution in energy storage technology and will replace traditional battery in certain ﬁelds. Ultracapacitor’ capacitance is usually between 1 F -5000F, even over 10,000F, while normal capacitors has a capacitance of pF or μF grade. Ultracapacitor typically store 10 to 100 times more energy per unit volume or mass than electrolytic capacitors, can accept and deliver charge much faster than batteries, and tolerate many more charge and discharge cycles,so Ultracapacitor has comparatively very high energy density than capacitor. 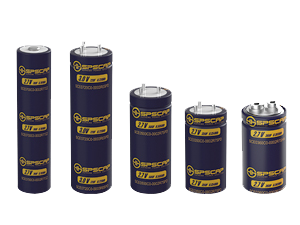 Spscap supercapacitor cells are constructed with two metal foils (current collectors), each coated with an electrode material such as activated carbon. Inside structure: wound anode and cathode electrode with separator. Outer structure: aluminum case, insulating sleeve. Different terminal designs such as lead terminal、soldering pin、Screw hole、contact type、welding laser，are different. SPSCAP ultracapacitor using high surface area activated carbon is based on the mechanism of separating the charges on the surface of carbon electrode/electrolyte to generate electric double layer capacitance. It obtains its surface area from porous carbon electrode material, the porous structure of the material make the per gram weight of the surface area to 2000 square meters. And the distance separated by electric charge is determined by the size of the ionic in the electrolyte, which is less than one nanometer. Appearance: Cylindrical, output can be same-end welding column type or thread type. SCE supercapacitor series can use laser welding connection or thread connection to realize series-parallel connection among cells. Characteristics: The advantages of SCE super capacitor series include small size and high power density, able to provide instant power output and to be used as backup power supply. The system voltage can reach 1000 KV after serial-parallel connection, suitable for high voltage and high power requirements. Vehicle power supply, pitching control systems of wind turbines power distribution terminal, electric tools, micro grid, industrial backup power, etc. Appearance: Cylindrical, different-end column welding output pattern, SCP super cap series use laser welding method to realize series-parallel connection. Large capacity, high charging and discharging current, small internal resistance, SCP supercap series are able to realize instant power compensation, vehicle braking energy recovery, and peak shaving and valley filling for power grid etc. New energy vehicles, wind power generation, rail transportation, heavy duty machinery, micro grid, industrial backup power supply, and robot, etc.